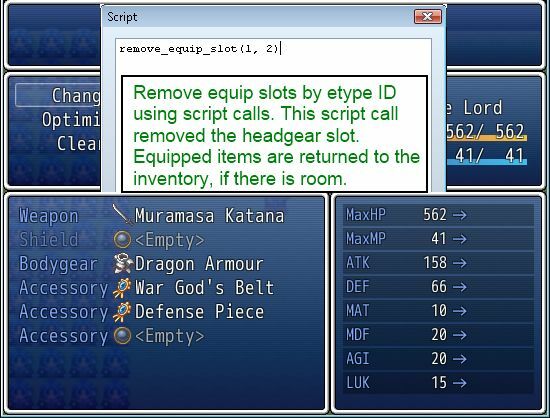 This script allows you to add or remove equip slots during the game using script calls. You can add or remove equip slots as many times as you want using simple script calls. Any equipped items in the removed slot will be returned to your inventory. Hello there. Can support be added for adding slots to an actor based on his/her position in the party? This script provides the methods for adding/removing equip slots. My suggestion would be to find a way to make script calls when you change formation or something. Hm, ok. I think I’m set on what to do now. Sorry, I can’t seem to post another reply in that comment series for some reason. Comments seem to be only able to go a few levels deep. Next time just reply to one of the earlier comments in the tree so it’s still localized. 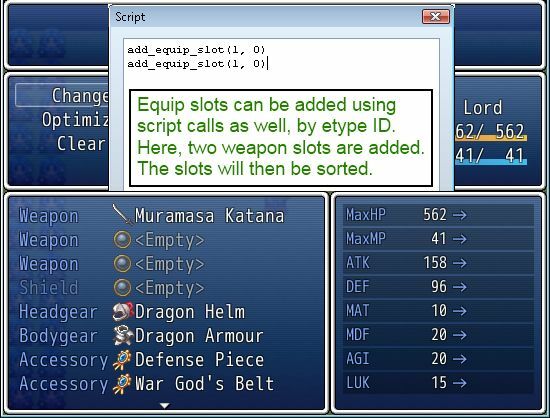 Equip slots are added or removed based on script call, so if you check the actor ID and it doesn’t satisfy the condition, then don’t make the script call, and the slots won’t be added. Interesting. Would it be possible to make with the dynamic equip slot adding/removing for one particular party member only? I have an idea for how to use this script, where there’s this unique quest item amulet that a character can wear, that gives extra equip slots to insert crystals into the amulet. Of course, there’s the problem of making sure all characters don’t get these extra slots atop it. Any ideas? The script currently only provides script calls, so I would imagine you can just do a condition check to see who is trying to equip it. Not exactly sure how i’d precisely go about adding a conditional branch to check on who is trying to equip in those extra slots. I mean I have a general idea, but not sure on the where. I’m guessing that the extra slots would still show up for all party members, though? The way the Core Equip Slots script is designed, each actor keeps track of which slots they have. This script builds on that concept and allows you to add/remove slots for each actor individually. Let’s assume the conditions don’t matter. How are you planning to add the slots in the first place? How I would have the slots be added is that I would have a parallel process common event that would check, on a loop, to see if any of the party members have said amulet equipped. If so, the script adds the slots to the actor who does, and then instead runs checks to make sure that the party member still has the amulet equipped. The player can’t remove the amulet from the party member without removing the crystals first, however. Presumably if you’re checking if the actor has an amulet on, you would be able to check this actor’s ID as well?